1. Screw: screw is made of special steel alloy, and it can be designed for different raw materials. 2. Barrel: barrel is made of special steel alloy, and is equipped with aluminum thermal foil with air cooling system. 4. Control system is using SSR contactless switch, and PID system for temperature control. 5 Transmission Motor: DC Motor, low and high speed power output, RPM and torque and can be uniformly maintained. 6. Extrusion Dies are made of SCM-4 with heat treatment, machining, measuring and finished with galvanizing. 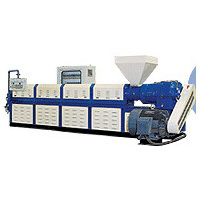 All extrusion dies are made for high resistance to acid. Change only dies and vacuum forming ring in case of switching to different pipe sizes.